Content not getting delivered to a subscriber’s email inbox is nothing short of a nightmare for a blogger. Specially the one who depends largely on mail subscribers and not search engine visitors for traffic. If you are facing a similar problem and you burn your feeds on Feedburner; then by the time you read this post entirely, you’ll be relieved. That is our assurance. The reason I’m so confident about it is because Feedburner has a built-in service to take care of the unwell or ill feeds. It’s name is FeedMedic and thankfully it works just like another feed. Instead of displaying messages in your Feedburner’s dashboard area FeedMedic create a feed which itemizes your feed’s health or status update. Before we proceed further, if you wish to transfer feedburner feeds then read our previous tutorial to do so. For getting the FeedMedic to work you need to activate FeedBulletin from the My Accounts tab; located on the top bar of your dashboard. 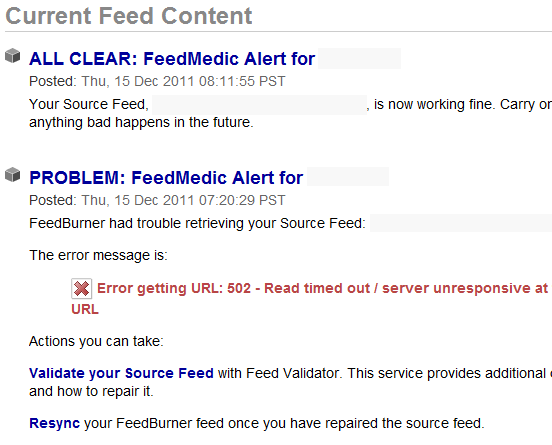 So if your feed is down then a new item titled : “PROBLEM: FeedMedic Alert for Yourblogname”. The content of such feeds usually contain two sub-headings, one for the list of errors and the second one for the steps needed to be undertaken in order to solve those errors. A similar feed item is created with the title ALL CLEAR… when your feed’s health is back to normalcy. The whole thing is actually named as FeedBulletin where-in FeedMedic plays the all important and major part. So the best way to use this service is to privately subscribe to the feed with your browser or your favorite RSS feed application. If you are using other newsletter services like Aweber, MailChimp then search in the settings or options of those applications for this sort of FeedMedic service. I’m pretty sure those private services also offer this with more advanced and friendly options. Which Email newsletter service do you use for your blog? Oh very good feature i will definitely try it.